Finding natural haircare products that give the same effects as their more toxic rivals can initially be a tricky task. Most of the time, natural shampoo can be low-sudsing and have a much more herbal or very little scent which some might find off putting. If you're one of those people that loves a shampoo with a good lather and a nice scent, just about strong enough to catch a little whiff on your hair throughout the day, then I think this duo from EVOLVh may be perfect for you! EVOLVh are a US brand specialising in luxury natural haircare. Their products are paraben, sulfate, gluten free, vegan and made with 90% or higher organic ingredients. I'm not sure how easy it is to get hold of them in the UK, but I received my travel size samples a couple of months ago in my first Petit Vour Box*. These little bottles of the UltraShine Moisture Shampoo & Conditioner are most definitely travel friendly; when I took them along with me on a little week away for my birthday last month, they stayed perfectly intact and didn't leak at all. I've had several washes with this duo so far and still have about half the bottle left of each so a little goes a long way. The first thing I noticed about these products is the scent. It really does remind me of "conventional" hair products with what I would describe as a perfumey scent. I did find it almost overpowering at first, but it's probably just because I'm used to very subtly scented products. Fast-forward a couple of uses though and it's actually grown on me and I've started to quite like smelling my hair during the day (as weird as that sounds)! In terms of performance, I've found they live up to their shine and moisture boosting claim. My hair is naturally a dry mix of waves, the occasional curl and plenty of frizz so I think this duo is ideal for my hair type. My hair is only slightly less frizzy after washing, but feels significantly softer with almost no tangles at all which I think is pretty impressive! My only qualm is I can't seem to go as long as usual between washes so alternating the shampoo every other wash seems to work best for me. I think if EVOLVh were easily available from a UK stockist I'd consider repurchasing these two products! 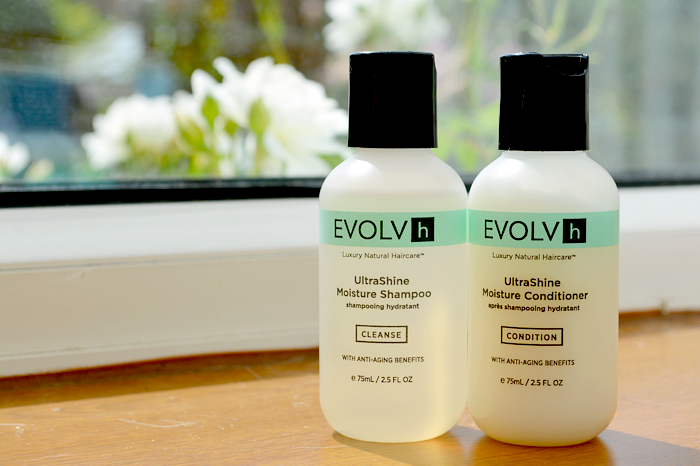 The UltraShine Moisture Shampoo & Conditioner are available for $8/$9 (≈ £5) travel size and $24/$25 (≈ £15) full size 250ml direct from EVOLVh website. (UPDATE: EVOLVh will soon be available in the UK from beautycrowd.com). Have you tried any EVOLVh haircare before?